If you thought that only automobiles could be cult objects, think again. It’s not just a 1965 Mustang or a ’66 ’Vette that sets the blood pounding, at least not for yachting enthusiasts. 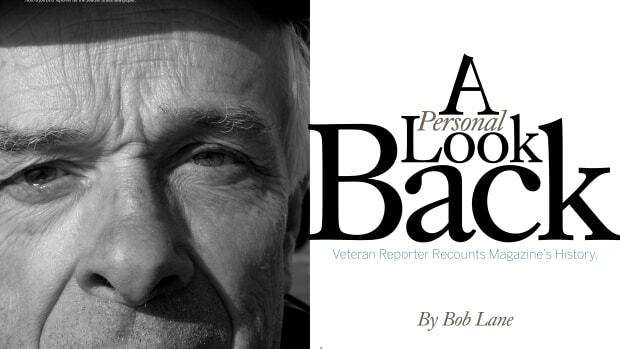 Chris Caswell takes a look back at one of Art DeFever's best designs. If you thought that only automobiles could be cult objects, think again. It’s not just a 1965 Mustang or a ’66 ’Vette that sets the blood pounding, at least not for yachting enthusiasts, because the boating world has its own cult boats. Think Bertram 31, a boat that is unabashedly wet, and Spartan. Just try to find a good used one that hasn’t been restored far beyond its original finish. Or a 13-foot Boston Whaler, which could pound your fillings loose in a chop but was unsinkable and which was the vehicle of choice for millions of youngsters, like me, for whom it was better than the first car. I still rue the day my dad sold it. If there is a cult yacht for the passagemaking set, it is this yacht. What makes a cult boat? Well, quality is the starting point as well as great design, of course. Then there must be a “rightness” for the intended purpose, such as fishing for the Bertram or chasing girls for the Boston Whaler. Timing, of course, is crucial: it has to arrive at the right place at the right time. There is also something indefinable, too, a certain pheromone that exudes appeal. And, of course, there has to be owner devotion, that near fanatical following of true believers who are also missionaries for their cult. And so we come to the DeFever 49. If there is a cult yacht for the passagemaking set, it is this yacht. 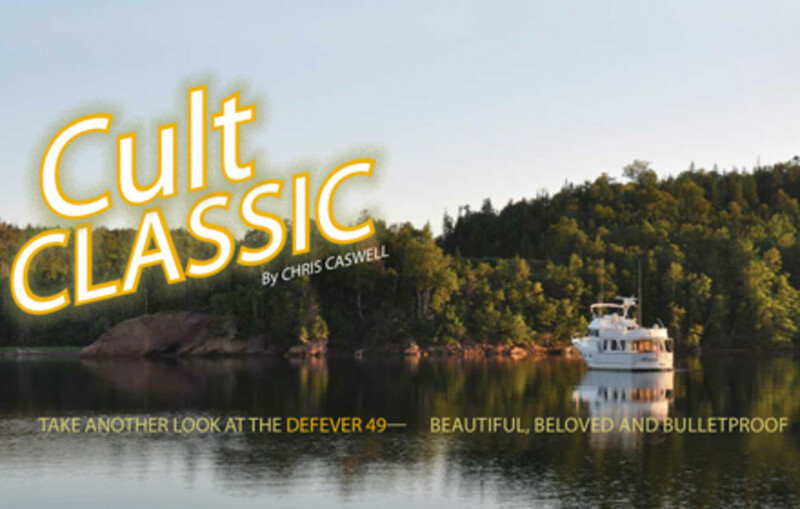 Built from the 1970s to early in this century, the DeFever 49 has all the above attributes of a cult object. It was built back before we knew much about fiberglass, so “more is better” was the rule. Tales of 2-inch solid fiberglass plugs drilled from hulls abound. With a range of a thousand-plus miles at a fuel consumption that sipped diesel and with a seaworthiness that shrugged off breaking seas, she was right even when diesel fuel was a buck a gallon. An Arthur DeFever design is pretty from most angles, with a springy sheer line that sweeps past the Portuguese bridge, along a protective bulwark to a comfortable cockpit. And, of course, the marque has a remarkable collection of very devoted owners—an owners’ website exists with a useful forum and planned gatherings, although, as one owner noted, “Anytime three DeFevers are together, it’s a rendezvous!” Most yacht builders only dream of such loyalty. 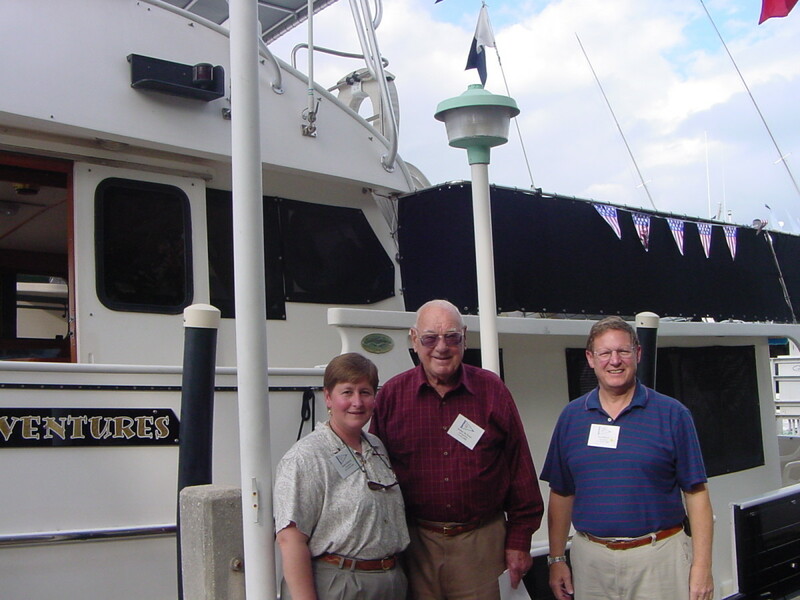 Naval architect, Art DeFever, on a visit with Jim and Robin Roberts. But the DeFever 49 is also a bit of a conundrum because there have been several different iterations over the years. Part of this came from a change in builders, part of this came from moving the yard from Taiwan to China, and another part came from natural evolution as systems, materials and the market changed over a quarter of a century. Of course, because the Asian boat industry has relied heavily on “design by Xerox,” a number of DeFever 49 copies have been created. As soon as the DeFever 49 caught on, other builders jumped on the bandwagon, claiming to have “DeFever-like” or “DeFever-inspired” versions. So the story really starts with Arthur DeFever who, as the son of a hardhat diver, grew up on the San Diego waterfront. After completing studies in naval architecture at UC Berkeley, he worked first for designers of large yachts, but before World War II he was on his own, designing the tuna clippers that lined the San Diego waterfront. Ranging from 90 to 181 feet, these clippers ranged as far as Ecuador and the Galapagos, staying at sea for months in all conditions until their holds were filled. Though these were working vessels, their clean and seamanlike lines were attractive to yachtsmen and, by the ’50s and early ’60s, DeFever had seaworthy “trawler yachts” under construction in the United States, Japan and Mexico. DeFever has sometimes been called the originator of the raised pilothouse motoryacht, which is a mistaken exaggeration. He certainly built his reputation on the raised pilothouse style, but he wasn’t alone, with Bill Garden, Ed Monk and others also penning similar lines as early as the 1930s. 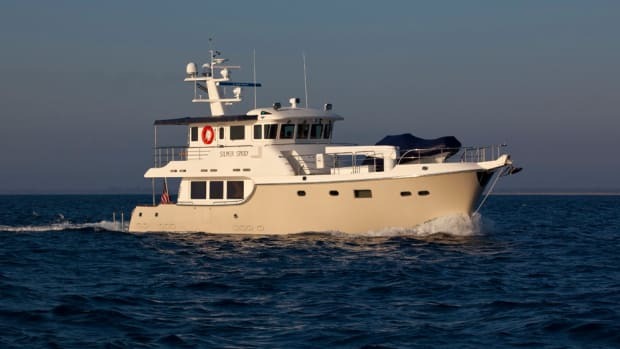 DeFever did jump into the spotlight in 1968 when he designed the Alaskan 46 for American Marine, the builder which would eventually become Grand Banks. The Alaskan 46, and the other Alaskans that followed, were built of wood in Hong Kong, and one glance shows their direct lineage to the DeFever 49. 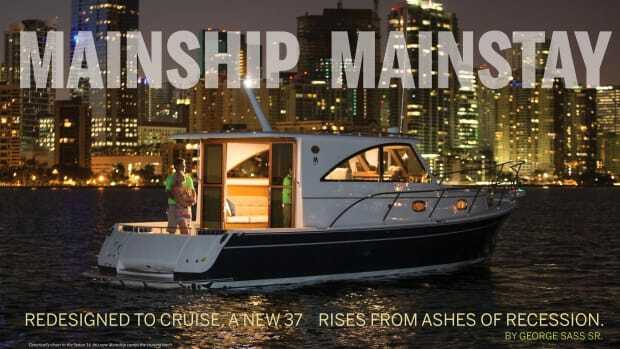 The Alaskans were popular, with some 159 built and there is a story, perhaps apocryphal, that when American Marine made the switch to fiberglass in 1973 and dropped the Alaskan line, the fledgling Taiwanese boatbuilding industry quickly filled the void. The first DeFever 49s were built by the Sen Koh yard in Taiwan in 1977 and continued until 1989, when production ended as the 64th yacht was delivered. Starting three years earlier in 1986, the CTF yard in Taiwan also produced a version of the DeFever 49, which is close enough to the original to be considered the same. 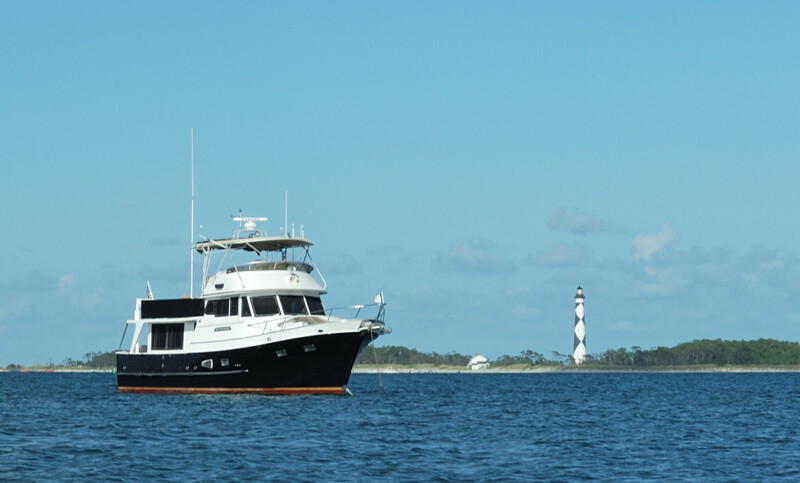 DeFever 49, Adventures, at Cape Lookout in North Carolina. Wilson Lin ran the CTF yard in Taiwan and, when added U.S. import duties hurt the Taiwanese industry, he moved the molds to China in the late ’90s and opened Pacific Ocean Countries Trading Association (POCTA). Many boatyards in Asia build for many clients, but POCTA only builds DeFever designs, although their current Pilothouse 50 is a variation from the original DeFever 49. New hull molds were apparently built by CTF/POCTA when the old molds wore out and, in the process, the hull shape was somewhat changed. Then there is the chine issue, which has perhaps been perpetuated by The Powerboat Guide, which lists the Sen Koh boats as a hard-chine version and the CTFs as having soft chines. Owners of both Sen Koh and CTF boats agree that there is only a cosmetic variation in the chine shape (probably from the mold change), and not enough to warrant the hard/soft-chine labels. So the DeFever 49 is, in many ways, like the paradox of my grandfather’s axe. It’s the very same axe, although my father replaced the haft twice and I replaced the head once. 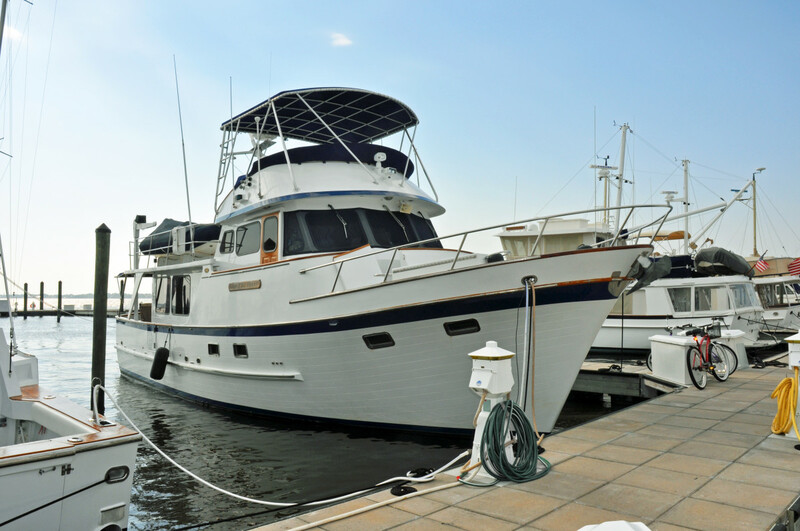 Through several builders, the DeFever 49 has changed subtly while maintaining its appeal. Because of all these iterations, the exact number of 49s built is difficult to fathom, but there were at least 64 built by Sen Koh. Its been said that anytime there are three DeFever&apos;s in one place, it is a rendezvous. 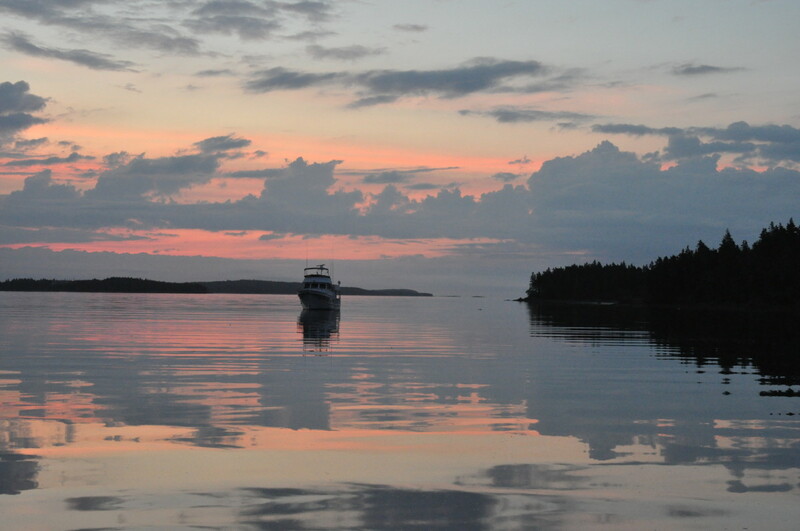 Knowledgeable DeFeverites can pick out the different versions of a 49 across an anchorage at a glance. 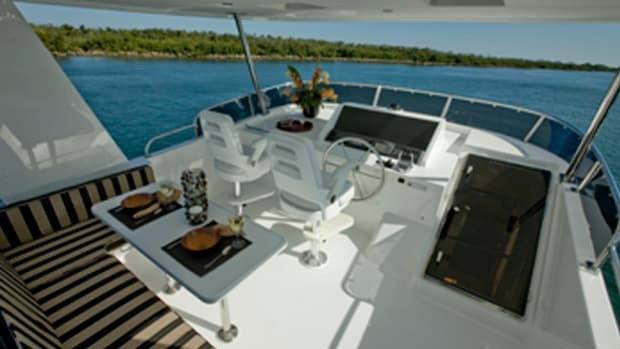 The Sen Koh boats had the flybridge on top of the pilothouse, which raised the profile of the yacht but also moved the helm forward for better visibility for piloting through reefs and created an immense boat deck. The CTF boats, on the other hand, have a lower profile with the flybridge starting just abaft the pilothouse with the windscreen atop the pilothouse. This moves the helm further aft and reduces the boat deck, but it creates a more modern and lower profile. 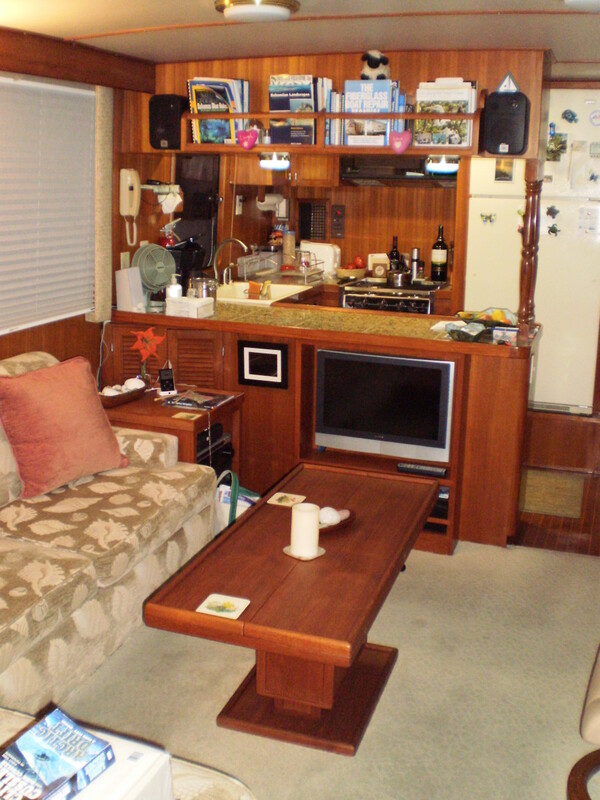 To accommodate the lower flybridge, the CTF boats also lost the pilot berth behind the settee in the wheelhouse. There are also the “Plan A” and “Plan B” versions, which seem to have been available through both builders. The original Sen Koh boats (Plan A) had access to the engineroom through a hatch in the galley sole as well as through a small door from the lazarette. The hatch had a vertical ladder and, as one owner noted, more than a few people have fallen through the open hatch, not knowing someone had left the galley hatch open while working in the engineroom. DeFever designed an alternate layout called Plan B. 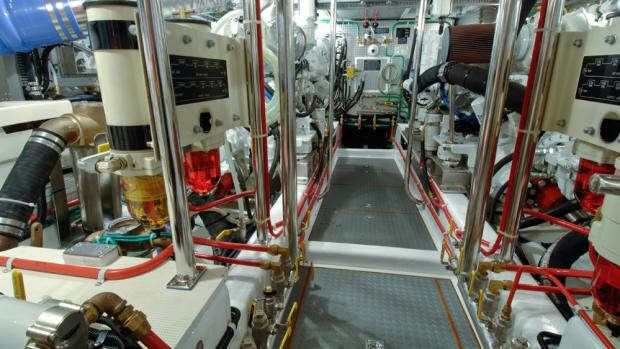 It included a stairway that went from near the galley into the master stateroom, which had the berth turned athwartships to allow a full-sized door into the engineroom through the after bulkhead. Regardless of the layout, the DeFever 49s are beloved by their owners. “We’ve been aboard a lot of boats, but after ten years of living aboard and cruising, there isn’t a boat I’d rather have than the boat we own right now,” says Robin Roberts who, with husband Jim, lives aboard Adventures, a Sen Koh boat that, at press time, is on a 450-foot freighter bound for the Pacific Northwest, where the Roberts’ plan to cruise for several years. Steve Koch echoes those sentiments. “It’s a damn good boat that will take you anywhere in the world you want to go,” he says. Koch and his wife Diane have lived aboard their Aurora for 13 years and, since both are USCG-licensed 100-ton captains, they should know. 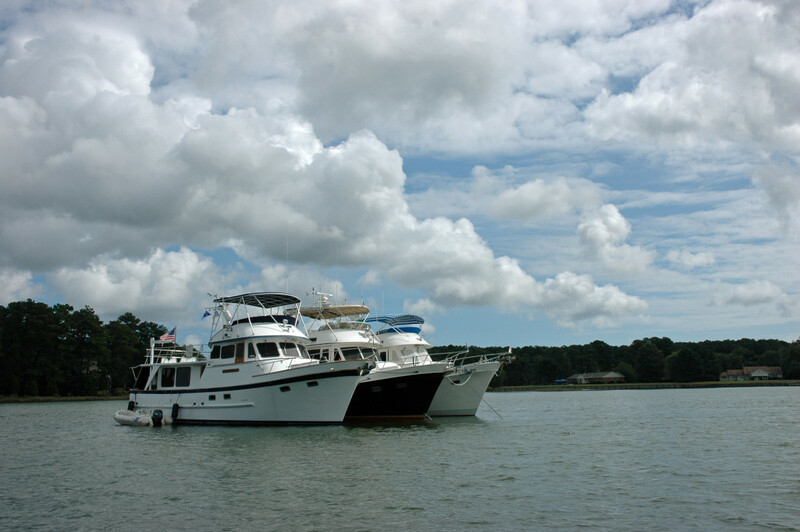 Aurora was built in 1989 and is the last DeFever 49 from the Sen Koh yard. On the other hand, the DeFever 49 is an easy boat for a couple to handle, with side decks protected by high bulwarks, the security of the Portuguese bridge, and easy access from bow to stern for docking. The saloon is easily redecorated, as none of the fi=furniture is permanently fixed. Inside, the 49 is unusual because the saloon furniture is loose, rather than built-in, which makes it easy for owners to redecorate or rearrange to their own tastes, mixing couches with easy chairs or even recliners for watching television. The galley is also popular, since it has ample counter space, good storage and appliances that owners have upgraded over the years. The forward cabin is for occasional guests, with most boats having criss-crossed V-berths, though some have only a single berth with extra cabinetry. The forward head is also marginal, since there isn’t a separate shower. This requires using a shower curtain and then drying off the entire head after the shower. But the DeFever 49 is a cruising fool. The Kochs have taken Aurora from Nova Scotia to Guatemala, gone up and down the East Coast numerous times, as well as a dozen trips to the Bahamas. The Roberts guess they have more than 25,000nm on Adventures (and 8,000 engine hours) from Nova Scotia to the Exumas. While both the Kochs and Roberts have Lehman 135s like many DeFever 49s, there were more than a few variations, since many of the boats were built specifically to owner preferences. Other engines included Perkins 135s and at least one boat had a pair of Cat 3208s. The DeFever 49 is a full-displacement trawler weighing in somewhere between 25 and 32 tons (depending on when it was built), so you aren’t going waterskiing with that 270hp engine rating. But Koch says the boat is really happy at about 8 knots at 1750 rpm. He says that gives him about 4gph, but figures that his fuel consumption, on a long-term average for all speeds, is around 1.35nm/gal. “At the end of the day, 8 knots has knocked off some miles,” he says. 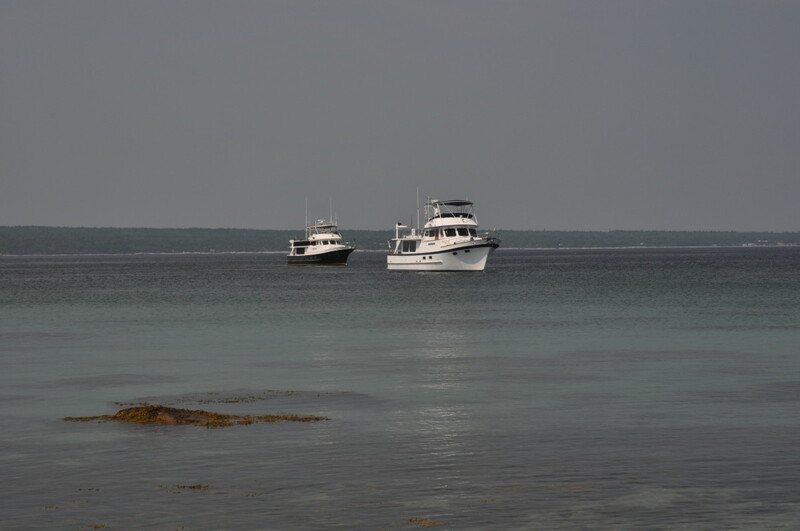 A pair of DeFever 49s near Port Mouton, Nova Scotia. For many skippers, the engineroom is one of the selling points for the DeFever 49, since it has nearly full headroom and plenty of space for added systems. On the Koch’s Aurora, they have upgraded with two large inverter chargers that can produce 240Ah and an HRO 600gpd watermaker. The Roberts, who spend considerable time at anchor, added an 1800Ah battery bank with Northstar AGM batteries. They also have a 25gph watermaker, and added Webasto heating for their Alaskan voyages. A huge lazarette is another bonus and, on Aurora, the Kochs installed a second generator there. The original 15kW genset is in the engine room (along with a washer and dryer), but they wanted a smaller night generator. Since the 6kW Northern Lights is in the lazarette (along with a 6-cubic-foot freezer), it is quiet for night use. Are there problem areas for potential buyers of DeFever 49s? Several owners noted that the early Sen Koh boats had plywood reinforcing under the boat deck, which has proved to be a problem for a handful of boats when leaks from unmaintained deck fittings caused it to rot. Later, Sen Koh and all the CTFs switched to Divinycell coring to eliminate the rot issue. “Because our boats were built in Taiwan with black iron tanks,” says Steve Koch, “we get asked a lot about tank failures and rusting.” He adds that he knows of a couple of boats that had to replace their tanks, but says, “That was from water leaks from around the fuel fills above the tanks that caused puddling and rust on top of the tank.” Koch epoxied the top of his fuel tank and rebedded the fuel fills as a precaution. One addition that Koch and other DeFever 49 owners have made is to install a snubber eye in the bow just above the waterline. Since the scope for an anchor is figured by water depth, plus the height of the attachment point (such as a bow roller) above the water, the nearly 10-foot-high bow of the DeFever 49 adds considerably to the scope needed. By using a length of line thimbled to the eye, which is backed by a huge plate inside the already thick hull, and then chain-hooked to the anchor rode, the necessary scope is reduced considerably. Aurora in Liscomb, Nova Scotia.